You enter the restaurant through these awesome castle looking doors! Give me a yellow dress and I would have felt like Belle herself! Not only the outside, but the inside reminds you of being in a castle. For lunch you stand in line below before you place your order. 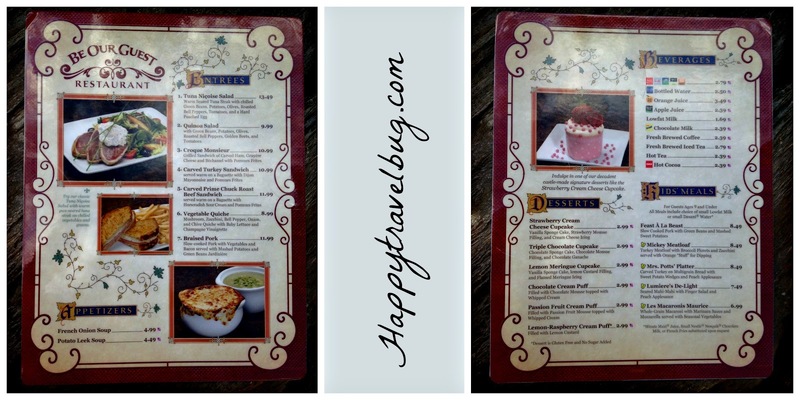 While dinner at Be Our Guest is sit down and order from a menu, lunch is a little different. You order at these computer screen things (which I show in the video below). They give you a “magic rose” that knows what you ordered and you take it with you to sit where ever you want. I was shocked when a server brought our food right to us. I said to the kids, “how did they know where we were sitting?” and my son said, “Mom, the rose!” It lets them know where you are and what you ordered. Pretty cool! 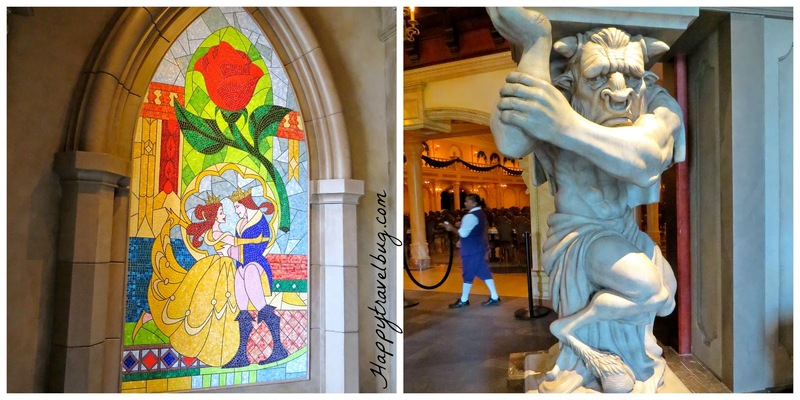 Remember, Beauty and the Beast takes place in France, so the menu is French inspired. I had heard they had amazing cupcakes, but nothing about the food, so I was excited to try it. Oh my goodness, soooo delicious! My daughter had the turkey sandwich with fries…and it was good. But the show stopper was what my son and I both had. Slow-cooked pork with vegetables and bacon, served with green beans and mashed potatoes (which are hiding under the pork). I grew up in the south with a Mom that can throw down in the kitchen and this tasted like something she made. Fantastic comfort food that was cooked well, seasoned well and served at the right temperature. I was happy! So was my son! Like I said, I had heard great things about the cupcakes, so we had to try them. I was hoping we could all get different ones and share, but no one was willing to not get the triple chocolate. We love our chocolate in this family! The triple was chocolate cake, chocolate mousse and chocolate ganache. I’d eat most anything with that combo! We devoured every bite! I wish I had ordered another one because they were only $2.99! That is less than the cupcakes cost at the cupcake store in my town. Way to go, Disney! 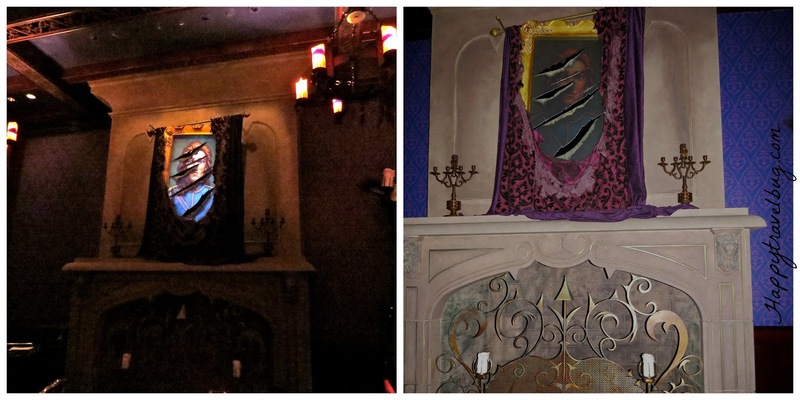 The other cool thing about eating at Be Our Guest is the selection of dining rooms. There are three total and this one above is the Ballroom. If you sit by the back windows it looks like it is snowing outside. That would be the location to run to in this room. I thought this was called the East Wing, but according to their website, this is Belle’s library. It seemed to be the least popular of the three rooms. But it was the most peaceful if you like that sort of thing. All the seats seem to be equal in status in this room. The most popular, and the one we dined in, was the West Wing. It is VERY dark in this room. I had to lighten the pics and I even used a flash with the second one. I heard one lady with vision problems say that she couldn’t see her food. But it you don’t have any issues with the dark, this is the coolest room. That photo of the prince would quickly change to the Beast during a “storm”. It sounds like thunder and flashes of lightening fill the room. And the west wing holds the infamous rose! Lots of people wanting pics with this, so if you don’t want that going on while you eat, pick a table not so close to the rose. 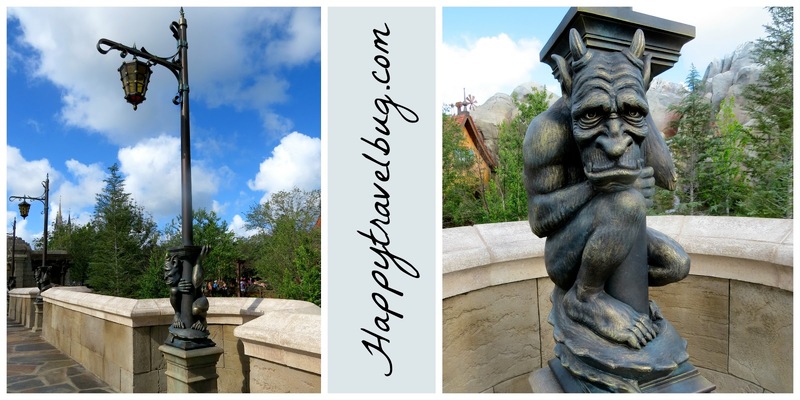 We really enjoyed our experience at Be Our Guest…the food, the atmosphere, the magic of it all. I will try to get dinner reservations for the next Disney trip, but if I can’t, I will stand in line for lunch again. I enjoyed it that much! Check out the video to experience all the sounds in action. Wow, that place is gorgeous! The slow cooked pork, green beans and mashed potatoes. Looks absolutely delicious! Wow that actually looks pretty good for Disney fare, I've never been impressed with their concessions, but this looks like a nice upgrade. I don't think they had food like that at Disneyland when I went there. Of course, that was in the Dark Ages. 🙂 The food looks fabulous and it sounds like it would be a lot of fun just to go there. I'll pass this along to my stepson and his family — total Disneyland fans. Not sure they have this place at Disneyland. But tell them it's a must do if they head to Disney World! Love Love Love this place!! It is so magical! ;) Def try to get dinner reservations next time as they make it super special! I agree the lunch wait is never that bad esp for the quality of food and being able to have your food brought out to your table, access to refills, etc as compared to other "quick service" places at Disney. Glad to hear you loved it too! Now that you can book dinner reservations six months out, it makes it hard for those of us that plan last minute trips. 🙁 But hopefully next time it won't be so crazy because it won't be new anymore. I want to go there! I'll make sure I bring a yellow dress. Maybe I'll skip lunch and just try all the cupcakes. How very cool to eat in surroundings so sumptuous. Interesting how technology is used here, in this old world setting. I'm glad to hear that your meal was like something your mom would have made — that's high compliment. Thanks for linking up this week, Sonja. It's a great combo of old and new! Thanks for hosting! I want to go here so badly now 🙂 What a setting and you gotta leave it to Disney with all the details. I don't think I'd eat much during my first visit since I'd be too busy looking around. Thanks for the insight! I'd love to eat in all 3 rooms. Glad you enjoyed it! Oh wow it looks beautiful!! My Dad's in Florida at the moment and he went to Magic Kingdom the other day; don't think he tried out Be My Guest though (he's not as much as a foodie as me)…safe to say next time I go I'll certainly be visiting! Oh good…hope you love it! Oh my mouth is watering! What a feast! I also don't remember food looking like that when I was last there. For quick dining, it was some of the best for sure! I want to eat here! The food itself sounds delicious. Disney really does know how to create a total dining experience, don't they? My family would think that rose telling the servers to bring the food would be so cool. My daughter hates thunderstorms, so we will be sure to stay away from the West Wing. Besides, sitting by the window in the ballroom sounds like the best table to me. Yes, stay away from the West Wing, that would probably freak her out! The snow in the ballroom was very peaceful and pretty…she'd like that! 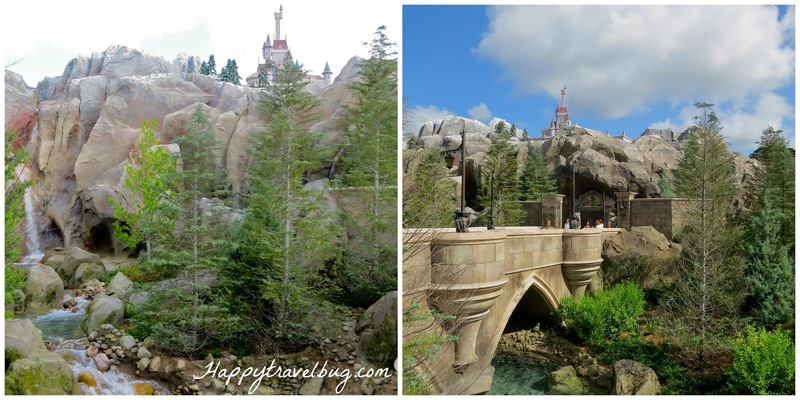 Wow, this looks like so much fun; makes me want to visit Disney again. And the food looks really delicious! I love that you take a rose to the table with you. Thanks so much for linking up to Inspire Me Wednesday. Featuring you in this week's issue. This is seriously so cool! Beauty and the Beast is my all time favorite Disney movie! Thank you so much for the tour!